It was a late December evening in 2011 when the idea for Ibiza Beach Club came to life in the minds of Manny O. and Francisco Beltran, a show and record producer, originally from Mallorca, Spain. Francisco Beltran came to the Philippines with hardly an expectation until Manny O.’s vision spoke to him, he immediately embraced it and was on board 100%. It was such an electrifying night of inspiration, powerful ideas loaded with intent and purpose to revitalise Cebu’s travel and tourism scene, that only a year later, the very first and the original Ibiza Beach Club in Mactan, Cebu came to be. The core idea for Ibiza Beach Club was to emulate the vibe of Eivissa – that you could have the best of both worlds in dining and entertainment. And why not? We already have some of the most stunning beaches and sunsets in the world, all one had to do was perfect the formula with good food and world-class entertainment. Where one could be barefoot yet elegant, loose yet refined. 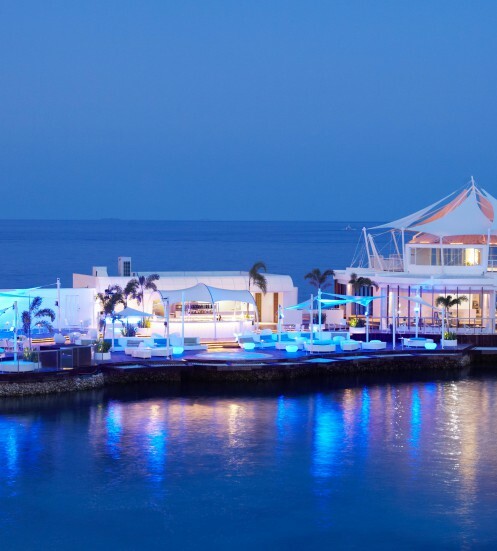 The Balearic-inspired 15-course Signature Grill is at the heart of Ibiza Beach Club. Premium meats and fresh seafood with a most impressive selection of fine wines, tapas to eat the night away and housing the most advanced sound and lighting system in the country, D & B Audiotechnik and Martin Audio to better highlight the 20-member Ibiza Beach Club Show Team. In-house as well as guest DJs spin the decks on some nights, and featured bands on other nights. The vision that is Ibiza Beach Club was completely embodied and distilled by the country’s premier designers – Manny Samson, Ivy and Cynthia Almario, Fred Valdes and Butch Valdes – inimitable creative minds who forged the brand’s unmistakable visual DNA from the vision of Manny O.; extremely photogenic, a social media darling in pictures. The IBC Performing Arts Academy was established to provide Ibiza Beach Club it’s bespoke entertainment. Spearheaded by Francisco Beltran, Entertainment Director of Ibiza Beach Club Inc.; Ayam Eckstein of Repertory Philippines, Trumpets Playshop and Stages Productions, Company Manager of IBCPAAI,; Randy Salvador of Nine Works Theatrical, Production Manager of IBCPAAI; Arnold Trinidad, of Nine Works Theatrical, Lead Choreographer of IBCPAAI; and Elisa Aurelio, a graduate of FIDM in Los Angeles, Costume Designer for the Academy. The Academy is a training centre for the Ibiza Beach Club Show Team, aspiring talents with background in theater and the performing arts. Additionally, this is where all the magic is conceived – IBC Theme Nights and Performances are birthed and produced here. As the Ibiza Beach Club brand gains traction with franchises globally, the Academy will train and groom talent purely for the brand. Outstanding hotel facilities include 245 luxury guestrooms and suites, most of which offer a spectacular view of the ocean as well as a unique vantage point overlooking Hilutungan Channel. Each room is complete with 5-star hotel amenities, Chopard luxury bathroom amenities and more. Complimentary Wi-Fi is accessible in all guestrooms and throughout the public areas of the hotel. The Monte Carlo Grand Ballroom stands at the core of the hotel’s event facilities. It is the largest of the function rooms and can accommodate up to 300 guests for a sit-down event and up to 400 for a cocktail party. Portofino and Cannes is the venue of choice for social events that can accommodate 60 guests for a sit-down event and up to 80 guests for a cocktail party. The Forum is the ideal place for a corporate function. It is an intimate venue overlooking the hotel’s landscaped gardens and features an open space layout, floor to ceiling windows and natural daylight. An elegant yet refreshing lounge featuring hard-to-find brands such as Hennesy Richard Cognac, Macallan, Taketsuru and Hibiki single-malt whiskies. For an al fresco dining option, The Forum also offers light snacks and refreshing beverages, which guests can enjoy by the swimming pool while basking in the sun. 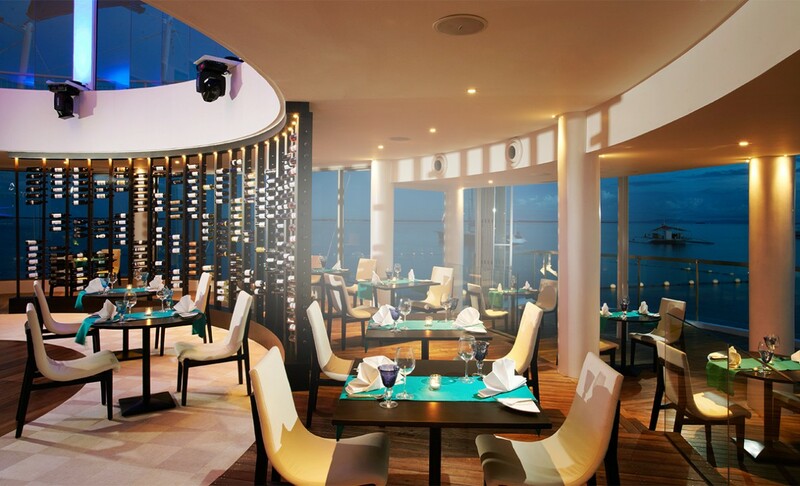 The Sails is the hotel’s all-day dining restaurant showcasing live show kitchens serving a wide range of European, Filipino, Japanese, Korean, Chinese and other international specialties. Adjacent to the main lobby in a beautiful setting of stark-white, Ferrari-branded parasails is the Lobby Lounge. The towering Venus espresso machine by Victoria Arduino is the focal point of the grand lobby and is where the Lobby Lounge brews an elegant cup of imported Mövenpick specialty coffee. Crafted by master artisans in the small village of Macerata in Southeastern Italy, it is the same espresso machine used at the Vatican. Linger over a special brew, devour the best club sandwich this side of the tropics or satisfy your sweet tooth with famous Mövenpick ice cream flown in from Switzerland. Complimentary bite-sized chocolates are also available from 3:00 to 4:00 pm during the daily chocolate hour, a Mövenpick Hotels & Resorts tradition. The Mövenpick Hotel Mactan Island Cebu enjoys its own pristine stretch of private, white sand beach. 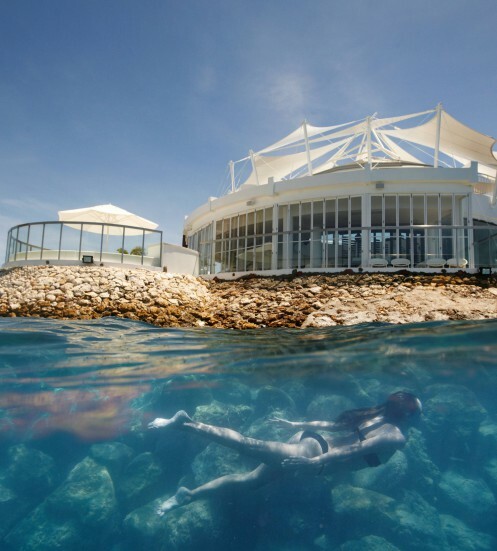 It also features its own marine sanctuary where guests may choose to snorkel or dive to explore the island’s exotic marine life. Keep fit during your stay by using our state-of-the-art fitness center or partake of lifestyle activities such as Yoga, Pilates, water aerobics, Zumba dance classes, mixology and culinary classes. The Game Room features everything from billiards to an Xbox Kinect. Guests who are travelling with family need not worry, as the hotel boasts a Kids Day Care where children can have fun. 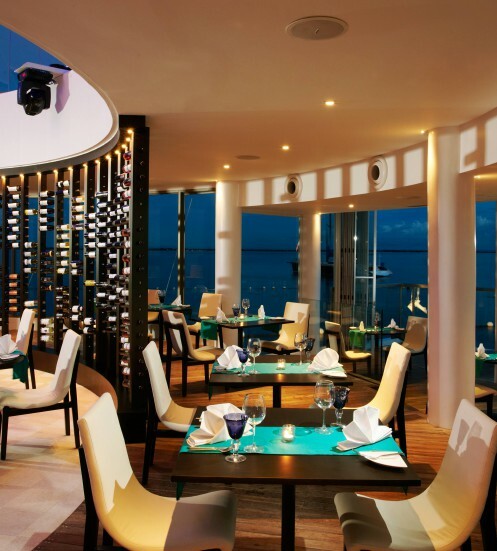 Every piece of furniture and interior design of the renovated Mövenpick Hotel Mactan Island Cebu is developed by world-class Filipino designers Manny Samson, Almario sisters Ivy and Cynthia, and Fred and Butch Valdes at the helm of the design consultancy group i5. The inspiration was to seamlessly blend sophisticated elegance and the contemporary Côte d’Azur style. We invite you to become a part of a lifestyle concept so exceptional, it will open your mind to a more heightened art of living. 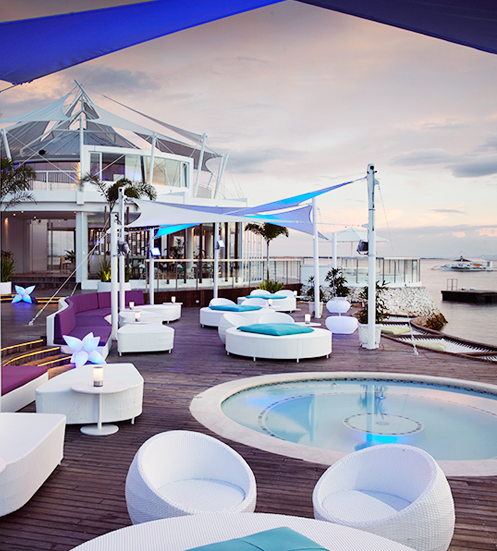 Mövenpick Hotel Mactan Island in Punta Engaño, Cebu introduces you to our exclusive Ibiza Beach Club Package. Offering VIP guests an indulgent getaway, it is a combination of leisure, wellness, entertainment, and non-stop fun—the way resort life should be. 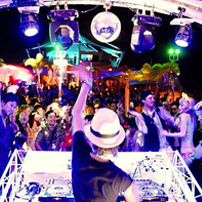 Ibiza Beach Club is the name that has commanded the beat of Mactan’s night scene for almost four years – stirring with flavours, sound, movement and fun. 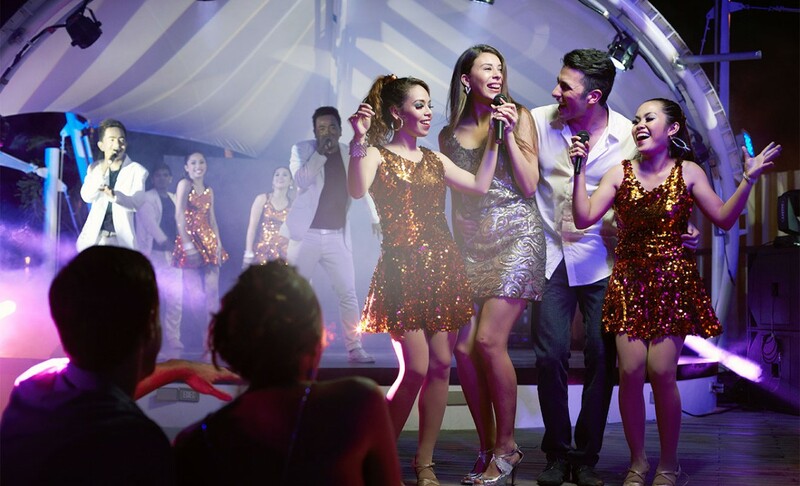 The restaurant’s standard quality of entertainment and themed shows is one that has been given great reviews and applauded by discerning audiences – a cross section from visiting tourists to celebrities and VIPs. The IBC Performing Arts Academy was established to provide Ibiza Beach Club it’s bespoke entertainment. Spearheaded by Francisco Beltran, Entertainment Director of Ibiza Beach Club Inc.; Ayam Eckstein of Repertory Philippines, Trumpets Playshop and Stages Productions, Company Manager of IBCPAAI,; Randy Salvador of Nine Works Theatrical, Production Manager of IBCPAAI; Arnold Trinidad, of Nine Works Theatrical, Lead Choreographer of IBCPAAI; and Elisa Aurelio, a graduate of FIDM in Los Angeles, Costume Designer for the Academy. The Academy is a training centre for the Ibiza Beach Club Show Team, aspiring talents with background in theater and the performing arts. Additionally, this is where all the magic is conceived - IBC Theme Nights and Performances are birthed and produced here. As the Ibiza Beach Club brand gains traction with franchises globally, the Academy will train and groom talent purely for the brand. As for the dining aspect, Ibiza is known for its Balearic-inspired, signature 15-course grill; simply, a meat lover’s dream come true. 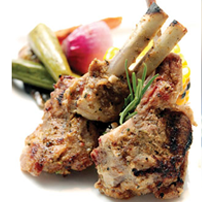 The meal is made up mostly of choice meats and seafood prepared in Balearic sauces and marinades with an Asian twist. “It’s going to be a fun Saturday night with high octane beats and mixes played by DJ Daiki, Tora, OGaMixxX, Shibuchin, Kamiyama Seigo, Toshiki, Red Bully and Hiroro,” said Paco Beltran, Ibiza Beach Club’s director for entertainment and events. 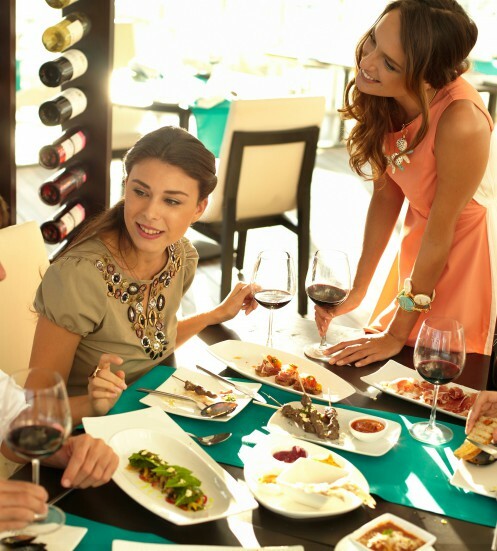 From latest news to our delightful menu, stay updated with the current happening in Ibiza Beach Club! Copyright 2016. Ibiza Beach Club. All rights reserved.